Or, on the road again. 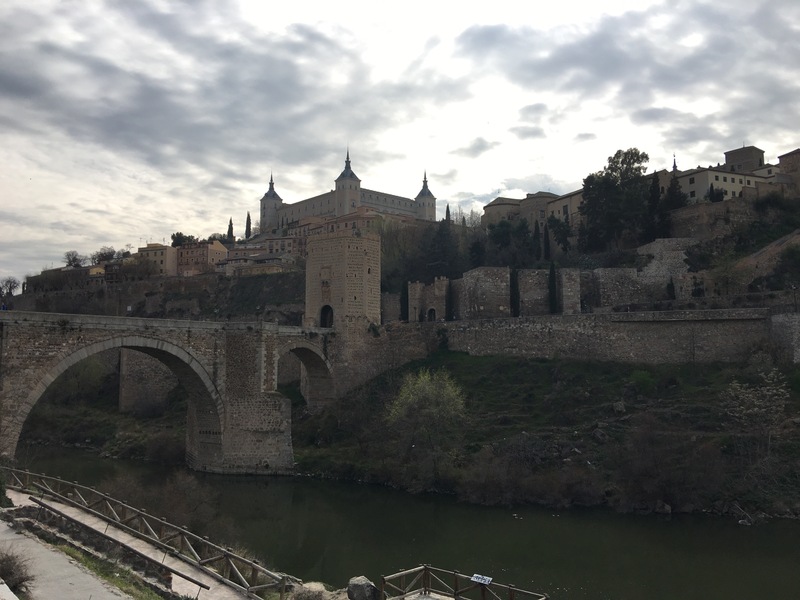 First stop this time: Toledo, Spain. Why? A few options: I’m as mad as my Fitbit is unhappy about crossing so many time zones; it’s becoming a habit to be in Spain in spring; I’m filling in time until after Jane and I go to Rome and come back here to tourist in Andalucia; or perhaps, it’s simple, I like both walking and being in Spain. A bit of the first and the last, mad and Spain and walking. So I’m back walking in Spain, a stage of the Camino Levante from Toledo to Zamora, all going well. 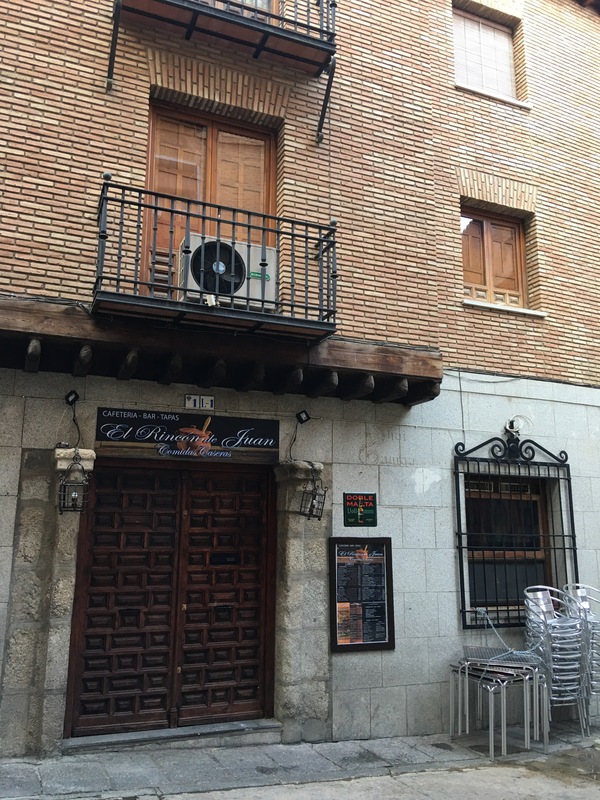 The full Camino Levante goes from Valencia, in the south east of Spain, to Santiago de Compostela up in the wet northwest of Spain, I walked a section a year ago, from Albacete, south of Madrid, to a bit west of that. And I hated it. Large flat areas, windy and boring. And I didn’t see one other walker, all obviously smarter than me. One really dodgy ‘hotel’ etc. I really wondered what I was doing. And stopped early. So why persist and do more? Because walking this section should be very different. The area around Toledo is not flat, boring and shouldn’t be windy. Cold. Of course. It’s March. This whole area has had known settlements for so long it’s amazing. From long before the Romans, Visigoths and Moores sequentially raped and pillaged through Spain. And were in turn conquered by the Spanish. Good old Isabella and Fred whose time came as the new world was being raped and pillaged by the Spanish in turn! Wheels and circles and then there are all the unknown who’ve lived here for millennia too. Back to the walk. 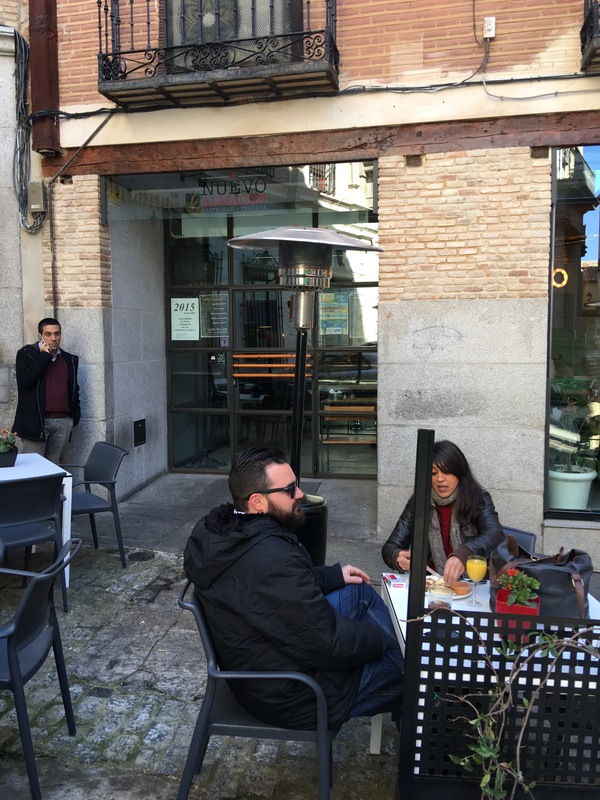 This section is about 300km from Toledo to Zamora, where it meets the Via de la Plata. First stage for me is the 140km, 6 or so days to Avila, a very old walled city west of Madrid. See, interesting. As should Santa Semana in Avila be. Four days in the Parador there so I can see the parades and excitement. Luckily I booked ages ago. This time I’m nervous. Like I was when I first walked in Spain in 2013. I’ve been so excited about this trip for a long time and increasingly nervous over the past week. I don’t know why. I can’t be sure if I’ll even meet other walkers, how it will be, if I’ll manage the couple of 30+km days. Will I find somewhere OK to stay. Will I enjoy it. The usual. Not like walking the Camino Frances with its many options for accommodation and so many other people. And I’ll miss JP (Jane) who made my last walk so enjoyable. We walked the 180km from Verin to Santiago in may 2015. Why do it? Why do I set up these challenges? Well, I like walking. Should be fit enough. Have problems, as always, with my feet. Nothing new. But a relatively unwalked Camino in spring and in a holy year. The last gives me hope I may meet other walkers. And I’ve got a good map app, and am excited to be off again. Hmm, to get Toledo I have first to get to Madrid, after Dubai and London, and then catch the rapid Toledo train. That means catching all 3 connecting trains in Madrid in the right directions. Then, getting a ticket for the train to Toledo. Think I’ve got the system sorted. And then I can let my Toledo Airbnb host know which train I’m on. Ahh, the best part so far, first class. 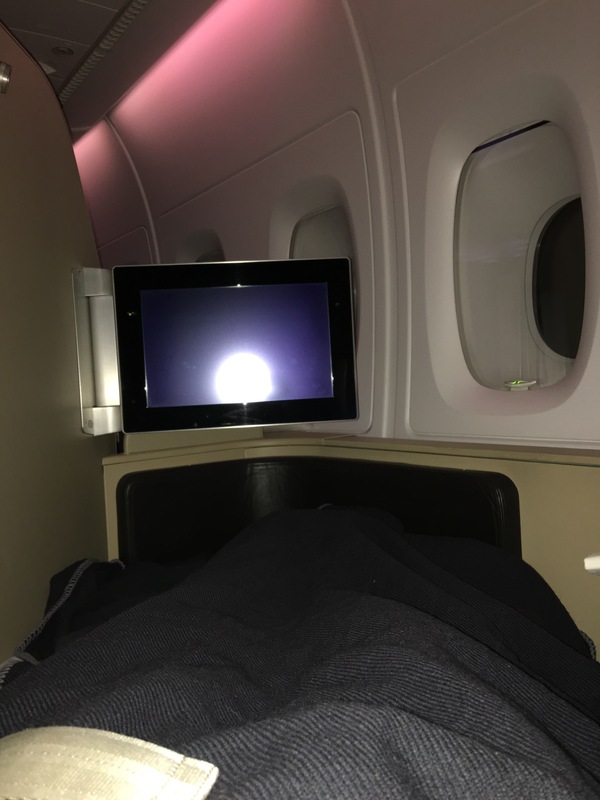 Yes, I was upgraded to first class on the flight from Sydney to London. How was it? Well, mentally compare sleeping flat on a sheepskin mattress at 30 something thousand feet up to the options. Wow. Yes, cold at 3C in London at 6am this morning. After weeks in Sydney of near, or over 30C, and with lows above 20C it’s very cold outside the terminal. Flying into Heathrow airport the clouds looked like rippled snow or moguls. Brrr. Cabin air seemed to be equalising in temperature with the look of the clouds. Cold. And growing colder. Brrrr. Dammit. My gloves and polar muff are in baggage. Airlines won’t accept walking poles and pocket knives so little of my gear is in the cabin with me. Let’s hope my pack turns up in Madrid with my flight and on the same day. And Heathrow is so busy. 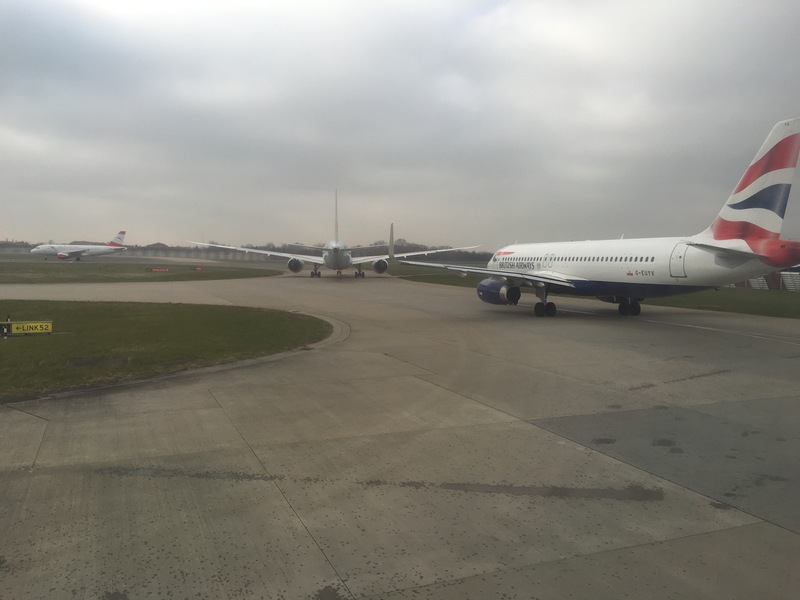 Three planes on the tarmac in front of us and seven I could see lined up behind us. And more coming into the rows perpendicular to the plane ‘waiting’ lines. A short time in Heathrow and then on again. The coast of France was magnificent from up above. Must have been the area near Brest, with the many bays and small islands and inlets. And then Spain and my first sightings of snow this trip. 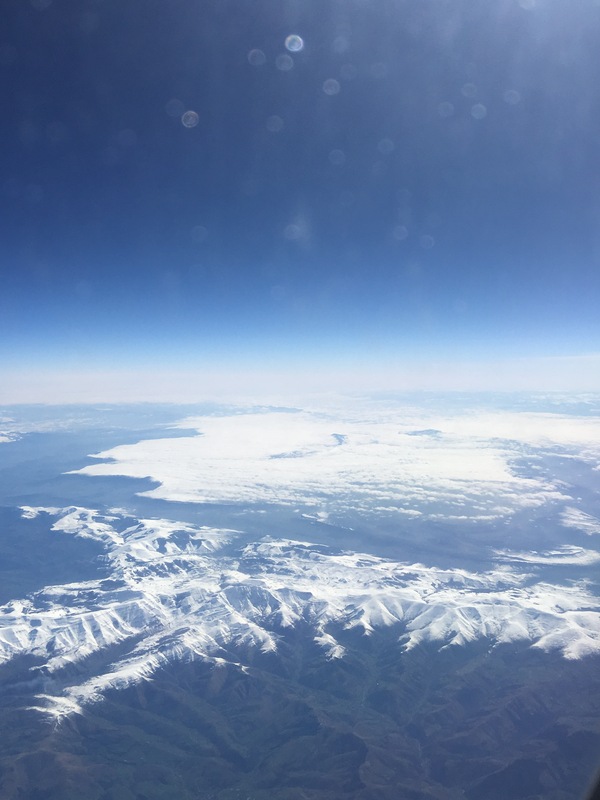 And large white clouds over the mountains north of Madrid. With lots of snow on the northern mountains. And a heavy white cloud cover to the south covering the area around Madrid. As we flew over the path of the Camino Frances, to the west of Burgos, a large area of cloud blocked our sight of the ground. How did I know where we were so precisely? A very clever app, Gaia GPS, with its gps and pre-saved maps made accurate positional locating possible. I am so glad I’m not walking there again at this time. After seeing the snow cover north of Madrid I have to hope for an early spring around Avila. Given it’s 10C on the ground in Madrid at lunchtime, I’m hoping. Or, I’ll change my plans. But, the covered areas in the north are higher than where I’ll be walking so I should be fine. Luggage appeared after a protracted wait. Spent most of the time speaking with 2 young Canadians off to walk the Camino Frances from Leon. They will no doubt enjoy the snow as they think minus temperatures are ok. I was too late for the next train to Toledo as the ticket line slowly inched forwards at Atocha RENFE in Madrid. While waiting the next hour I had a cafe con leche in the place JP and I met 2 Sydney women last time. This time I chatted with a local woman waiting for a train, asking her about the beggars as i saw her give money to a middle aged woman. We ended up talking about how difficult life is in Spain for many people, from those just finished uni now needing to work in another country, such as Germany, to many families having to move back into multi-generational situations to make ends meet. My foreignness shines out. Beggars on the train and in the train station avoided me. And that’s without hearing me mangle Spanish. Yes, glad you asked. Five months with no practise, since school in Oaxaca (Mexico) means I’m well behind the 8 ball again. Getting the password for wifi in a coffee shop should be easy but I confused capital with small letters. 🤓 took a while to figure. Finally, back to Toledo. Met my host near the farmacia in Plaza Zocodover. Easy. He, and his young daughter, arrived promptly and off we trotted. I swear that if I didn’t know this part of Toledo I’d never find the apartment again. Along one of the lesser streets out of the square, around corners, past La Alcabadia and we were there. So, an inconspicuous wooden door along a narrow street, around a corner in an old stone building and we were in. Dark, wooden stairs. Hard to see where we were going, just up, carefully. And then in. Entrance, open lounge, kitchen, bathroom and a bedroom. Better than a hotel. They took me to the local supermarket and fruiteria, ones I’d been to before so I can refind them. He obviously has no idea how complicated finding your way around here is. Or is it me? Just hopeless without a working gps. Than heavens for the space race that gave us the gps. Impressive skyline as you walk up from the Toledo station. Views from the two sides of my apartment are the same, windows with balconies and brown bricks. The only difference is the ground floor restaurant on one side. 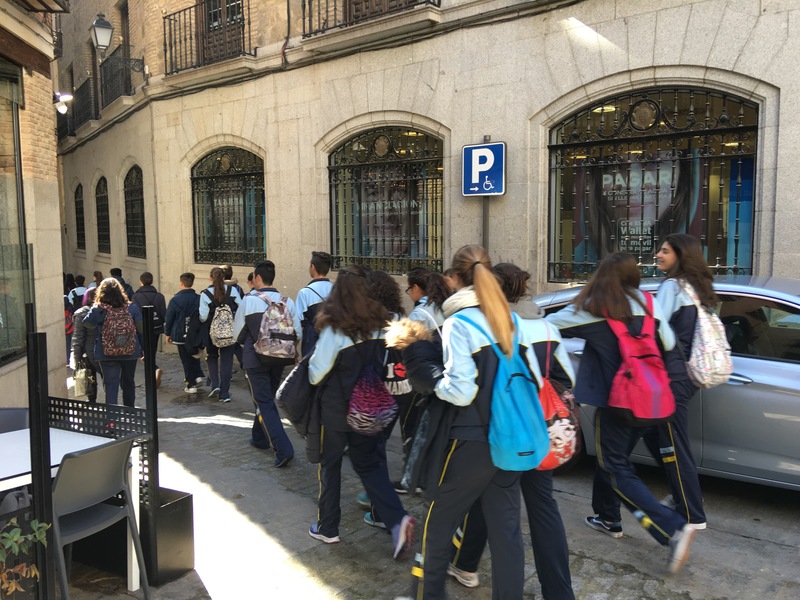 School kids seem to be on excursions in most Spanish cities. Here it’s even more obvious. Mostly Spanish kids today. Noisy, jostling their way along the narrow back streets here. And breakfast. Just near. Carlos showed me yesterday. For €2.50, orange juice, coffee and toast with tomato and olive oil. Very good deal and, nice. Must go when JP & I come back late April. Not doing a lot today, priority is setting up my pack for an early start and making sure I get a good night’s sleep. Glad you made it happily to Toledo. I enjoy reading your accounts.